For a large part of the existing buildings and infrastructure the design life has been reached or will be reached in the near future. These structures might need to be reassessed in order to investigate whether the safety requirements are met. Current practice on the assessment of existing concrete structures however needs a thorough evaluation from a risk and reliability point of view, as they are mostly verified using simplified procedures based on the partial factor method commonly applied in design of new structures. Such assessments are often conservative and may lead to expensive upgrades. 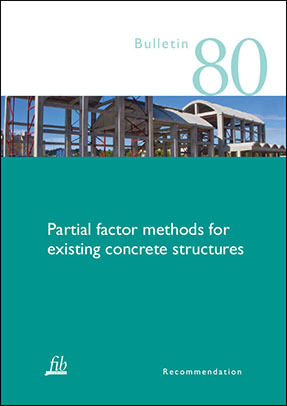 Although the last decades reliability-based assessment of existing concrete structures has gained wide attention in the research field, a consistent reliability-based assessment framework and a practically applicable codified approach which is compatible with the Eurocodes and accessible for common structural engineering problems in everyday practice is currently missing. Such an approach however allows for a more uniform, more objective and probably more widely applied assessment approach for existing concrete structures. Hence, in this bulletin two different partial factor formats are elaborated, i.e. the Design Value Method (DVM) and the Adjusted Partial Factor Method (APFM), enabling the incorporation of specific reliability related aspects for existing structures. The DVM proposes a fundamental basis for evaluating partial factors whereas the APFM provides adjustment factors to be applied on the partial factors for new structures in EN 1990. In this bulletin both methods are elaborated and evaluated and a basis is provided for decision making regarding the target safety level of existing structures.